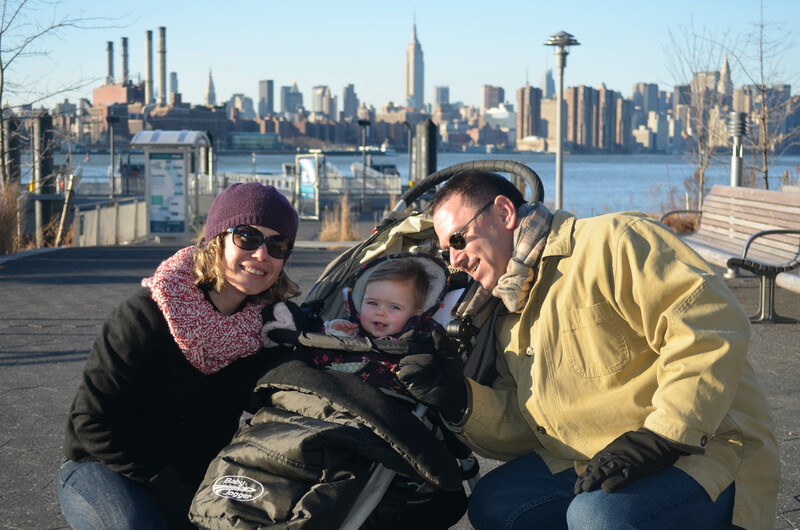 To some, New York City is not the preferred choice for a relaxing vacation with a 1-year old. The logistics of just getting to/from the airports is reason enough to travel alone– with one carry on bag. En route back to London, we decided to continue our daughter’s 1st birthday celebration in the Big Apple. As I squashed the (4th overstuffed) suitcase close and scanned my parents’ floors (again) for stray birthday gifts without a bag to transfer back home, I (again) wondered what my husband and I were thinking the night we booked a red eye flight to Newark Airport. Would it not have been easier to just book a direct flight back to Heathrow? I tossed and turned all night anticipating my 3am alarm to sound. As I splashed water onto my bleary eyes, I reminded myself—Four Seasons Hotel New York, not Newark Airport, is your final destination today. Suddenly airplanes, trains, trams and taxis faded into a serene montage of my family taking an afternoon nap, drapes drawn, snuggled together under our plush duvet. 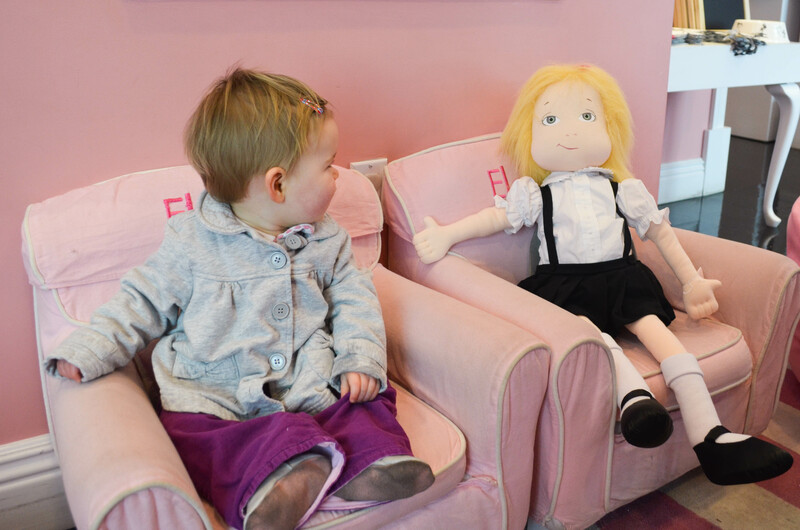 As my husband and I are both hoteliers, I often get asked if we named our daughter, ELOISE, after the ever popular children’s books series by Kay Thompson. In short, we did not not not. But just like the precocious Plaza resident, our Eloise is learning early on that Oooooooooo she absolutely loves loves loves nice Hotels. It seems that Eloise may be a city child. In her first yellow taxi ride from Penn Station to Four Seasons Hotel New York, she squealed with laughter and ooohhhed and aaawwed at all the sights seen through the window. 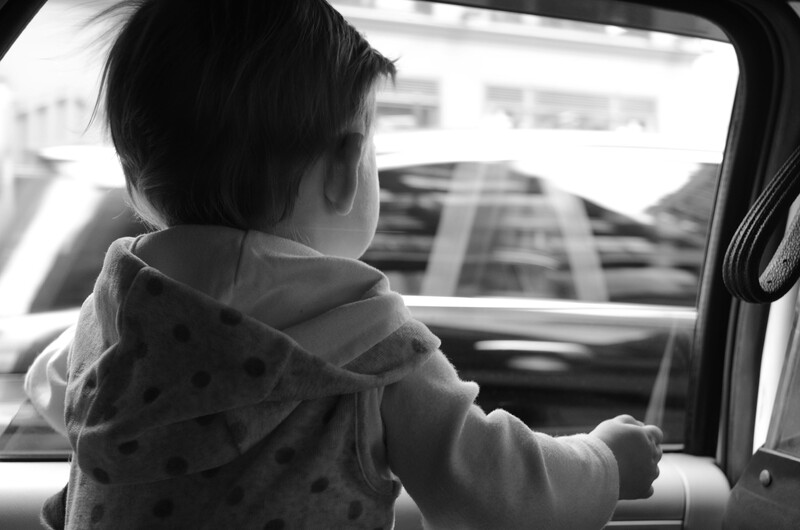 At traffic lights, she waved to fellow taxi passengers as if to tell the City- Bonjour! Je suis arrivé…. 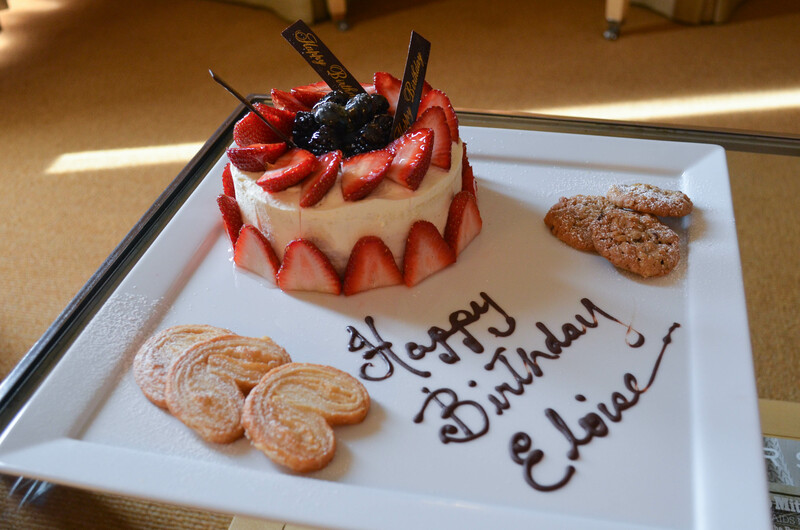 News of her recent 1st birthday had filtered to the Hotel staff who welcomed her with celebration for her crowning achievement. Reception presented a basket overflowing with stuffed animals, all hoping to be her newest favourite toy of the minute. After some convincing, and prying other beloved stuffed animals from her locked fingers, a sock monkey joined our troop as we went up up up to the 27th floor. Although Eloise shared a room with us, it was set as if she was travelling alone. 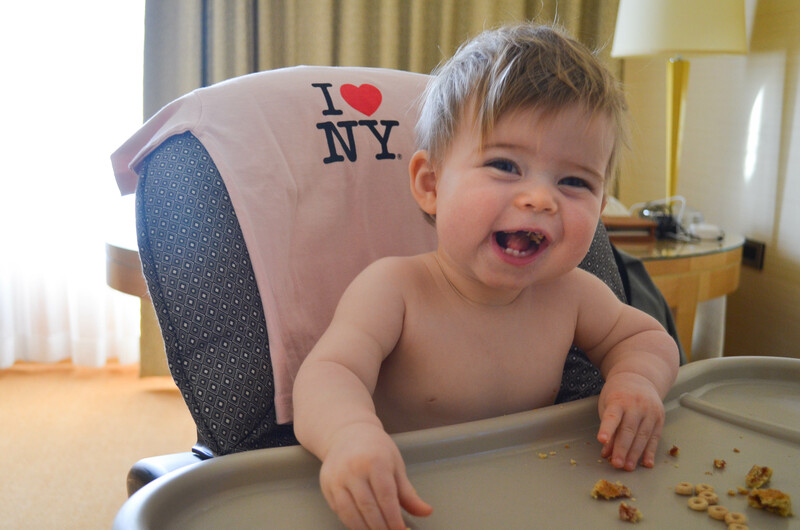 We found our room stocked with a beautiful crib, child’s duvet and matching bumper pads, high chair, baby food, bathmat, toys, soap, powder, shampoo, lotion, I♥ NYC t-shirt… and a personalised birthday cake. Ooooooooooooooooo we absolutely love Four Seasons Hotel New York! After Eloise took in the view from above, we decided to head out for some fresh air and to find a playground to unwind. A few blocks from the Hotel is Central Park. The rows of street vendors and horse carriages are tell-tale signs that you have found the City’s oasis. I have always been in Central Park during the summer, but discovered I enjoy it as much, if not more, in the middle of winter. As the trees are bare and you are restricted to the footpaths, I paid more attention to the surrounding skylines and diverse architecture of the buildings. We watched the ice skaters for a while and I imagined us returning to this same spot in a few years with Eloise ready to take on the rink in her first pair of ice skates. That afternoon we walked over the Brooklyn Bridge. It’s a walk all, young and old, should do at least once. The views looking back at Manhattan are stunning, and the bridge is an engineering marvel. The next morning as we were leaving for brunch, my husband stopped to chat with the Hotel Manager in the lobby. Sometimes Eloise has a temper fit. But not very often. It was her mid-morning power nap time, and I was trying every trick in the hat to prevent a melt down on the newly polished marble floors…We took photos with the receptionist. We admired the beautiful jewelry display- three times. We practiced standing up in the lobby furniture. Oh my Lord. Eloise is soooo busy. But she wanted to crawl. And so she did. 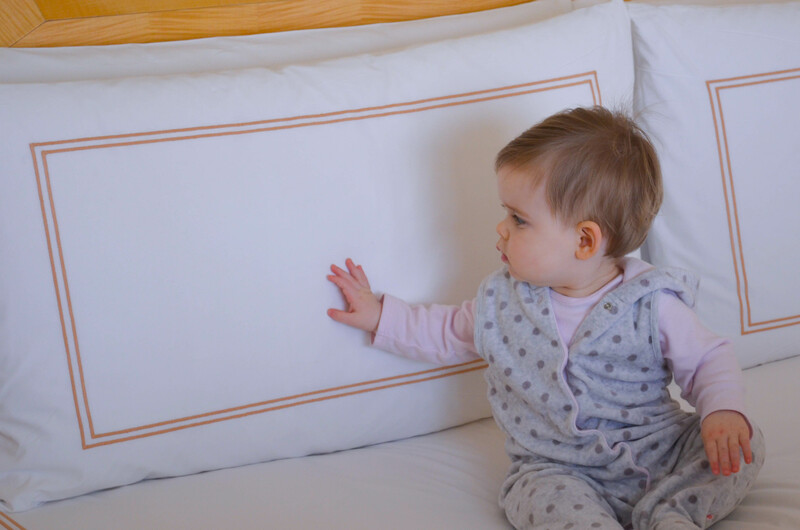 The Hotel Manager caught a glimpse of the determined infant on the move and suddenly appeared with an armful of toys which he placed on the floor in front of Eloise. At the same time, the elevators opened with Hotel guests wishing to stop by reception. As I lunged towards Eloise, and the toys, to clear the walkway, one of the Hotel’s guest kneeled down and began to play with our daughter. The power of a cute smile- for Lord’s sake. After three nights in the city that never sleeps, it was time to load up the yellow taxi with our overstuffed bags and head back to Newark Airport for the final leg of the journey. Oh my Lord. There is still so much to do! Reason enough to keep returning to New York. Thank you very much, NEW YORK! 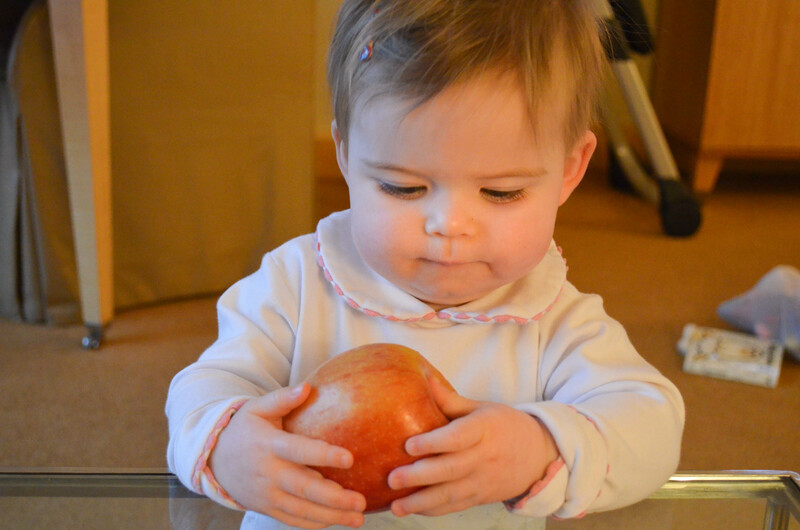 Precious blog about a PRECIOUS baby! She's definitely living the good life and, I'm sure, will have many more wonderful adventures in other Four Seasons Hotels around the world!